There have been thriller sagas which continue to mesmerise and enchant the readers. Be it a legal one or a banking drama it all takes that one hard hitting idea which makes the readers dance to its tunes. 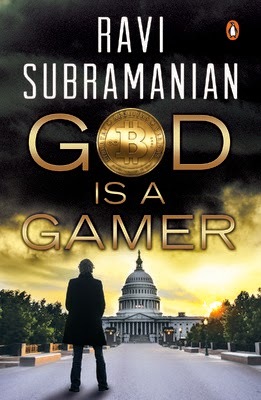 Author Ravi Subramanian in his latest offering 'God is a Gamer" sheds light on the untouched aspect of modern times i.e bitcoins. So has he done justice enough to the idea? Let's find out. First look at the title and the cover and a reader feels confident of delving deep into another banking thrillers by the author. The enhanced image with a lone man and bitcoin in the backdrop adds to the curiosity of the reader. The blurb talks about a man and his struggle to keep his fortune and company alive through unexpected quarters. The blurb talks about an aspect of the story but manages well to conceal the main motive of the entire narration. The story is set off in Mumbai and U.S.A, where couple of incidents together discharge a calamity and creates furore in the lives of few people in NYIB, one of the largest banks of India and in the President office where they go on to lose one of their own. But the scattered dots look vague and it all it set into motion when agents from USA and the local police of Mumbai gets involved to discover the mystery behind the entire fiasco. So who takes the fall and who ends up rich? Who is innocent and who's the liar? Who will survive the whirlwind world of banking and bitcoins and who will live to tell the tale? That's what the story is all about. The story gets a new kick by setting in motion smaller chapters for the readers. It doesn't puts extra pressure to decipher the entire drama as it unfolds. The quirky and chirpy narration keeps the readers engaged. The banking and bitcoin fiasco work in tandem to provide readers the thriller which they love to experience. The book goes in circles and keeps a tentative check to make life difficult as to who and what is amiss. The story grips with time and the momentum makes it cruise along on a long journey. The traversing nature of the story is another remarkable way to handle the story. The events plucked out from reality is another feather in the cap. The downside of the book is it's bitcoin saga, which fails to weave the magic in entirety. The parallel plots does provides a lengthy support to the story but it takes bitcoin into the backdrop and let other ideas flourish among all. The uncountable number of characters is also a huge turn off as it looks clumsier once it garners reader's attention. The book dulls in the middle as the parallelism doesn't makes it move and the ride turns out to be bumpy and uncomfortable. The story towards the end doesn't gets the similar treatment as it does in the initial phase. The gaming industry idea too proves to be a bitcoin nemesis in the story. All in all the bitcoin proves to be a bitter-sweet affair. The scandalized nature of the story works in favour of it . Enough leverage was needed to keep bitcoin at the helm of the storyline but it fails time and again. The gaming industry and other fiasco's meticulously charted out with plenty of experience from the author's pen beforehand. The book is an altogether different offering but comes at a cost of dullness at times and expectations hitting out of the rooftop. The painstaking efforts of the author does count. As a thriller it weaves its charm but as a bitcoin thriller it's not of the magnitude to generate a collateral effect which could have captured the heart and the mind completely. It's a reader's dream with a brandishing new idea but not with cleanest of executions.